Lately, the hubs and I have been reading Smart Money Smart Kids: Raising the Next Generation to Win with Money by Dave Ramsey and Rachel Cruze, Dave Ramsey’s daughter (Find it on Amazon). And even though we read at totally different speeds, and have completely different interests when it comes to reading, we’ve committed to reading it together. In the car, at night, or when we have a spare moment, he or I will read out loud so that we’re both on the same page with this book. It’s all because when it comes to money, we both feel like didn’t get a very good education. Sure, there are families who leave their kids in FAR worse positions than we were in – and of course, we were very lucky to start changing our spending habits at a young age – but we are both committed to making sure. Yep, I have some disagreement’s with Dave Ramsey and his money philosophies, but that doesn’t change the fact that raising your kids to make saving a priority, avoid debt in nearly every case, and to give generously is a bad thing. In fact, I think that those principles can lay the foundation for a very solid financial future. And that’s a gift we want to give our daughter. Best of all, it doesn’t cost much. I can’t tell you that a good financial education is free. In some cases, it might cost quite a bit, but I believe that the value you get from the cost of a solid financial foundation far outweighs any cost. Now, our daughter, Jessica, is only 2 1/2, but the reason we’ve already started reading Smart Money Smart Kids is because we want to discuss these things together as a couple, implement the suggestions in the book together, and have our heads in the right place as she gets older. My husband was very anxious about reading a Dave Ramsey book, fearful that he would find boring or over his head, but I’ve got to tell you that this book is a great read. It’s funny, full of real-life experiences, and is overall a practical and helpful easy read that anyone can handle. It’s also not super long, which certainly helps make it easy to read. So we’re loving the methods in this book, and the first one Dave & Rachel talk about is getting your kids to put their birthday/chore money into three separate banks: one to save, one to give, and one to spend. They rightfully suggest using clear banks, and dollar bills instead of coins so kids can really see the impact of their money right on front of them. The dollar bills fill up the bank faster than coins to, really allowing them to see their money. This makes sense, especially since they suggest this starting at about age 3. Kids this age only understand what is right in front of them and really enjoy stuffing money in a bank. So of course, I set out to buy “Spend, Save, Give” piggy banks from Amazon with money I had earned with Swagbucks. I told the hubs my frustration. Even though the Swagbucks were essentially free money, I work hard for my Swagbucks and try to stretch them as far as I can make them go. This just didn’t seem like a good use of that free money. Luckily my husband, ever the practical one had a great suggestion: why not just use mason jars? 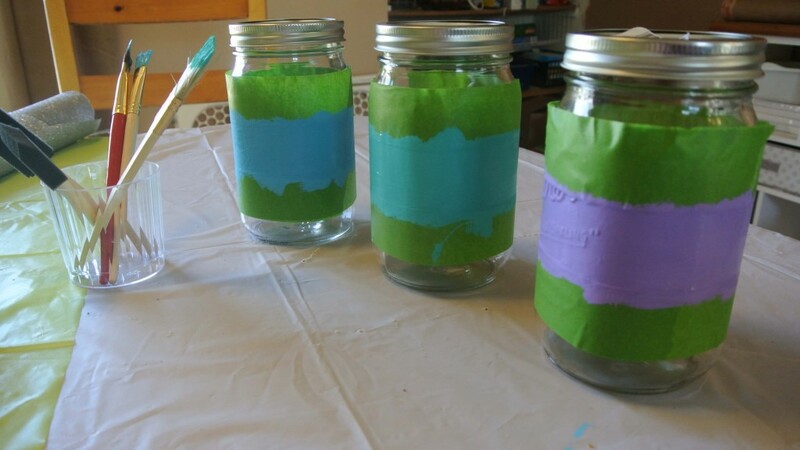 Next, paint each jar with one of the colors you’ve chosen. I did 3 coats, which may have been a bit much. You could probably get away with 2. 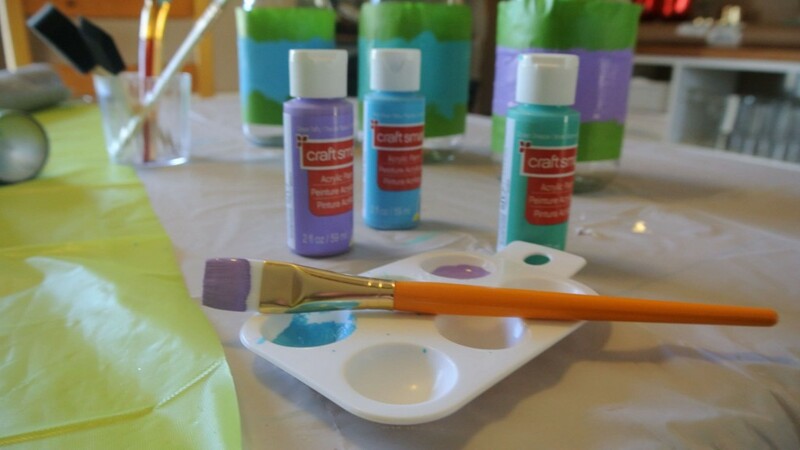 Wait 15-20 minutes between each thin coat, remove the painters tape, and let them sit overnight to dry completely. I decided to add a bit more color with a “dipped” look on the bottom of each jar. I did wait overnight to do this part though, because I didn’t want to risk messing up the first stripe of paint. If you’re feeling brave, you could definitely do both at the same time. If you tend to be kind of messy like me, give the paint a rest overnight before you attempt the dipped part. Oh, and if you make a mistake on these, don’t worry! A little razor blade will take the paint right off, which is both a blessing a curse. For the next step, you’ll need to print out the words “Spend, Save, Give” on your printer. I’ve created a handy pdf download if you want your letters to be the same size as mine, which you can print right here. Take those letters, and cut out around them in a rectangle. Don’t go around every letter, just cut out a rectangle around each word. Flip them over and attach them to the wrapping or scrapbook paper (sparkly, of course!) with the spray adhesive so you can easily cut out the letters. Then, take your time cutting out the letters. I used a combination of scissors and an Xacto knife to cut the letters out, but honestly the hardest part was taking my time. I’m not exactly patient! But, if you take your time and cut the letters out exactly, you’ll definitely see the difference in the finished product! 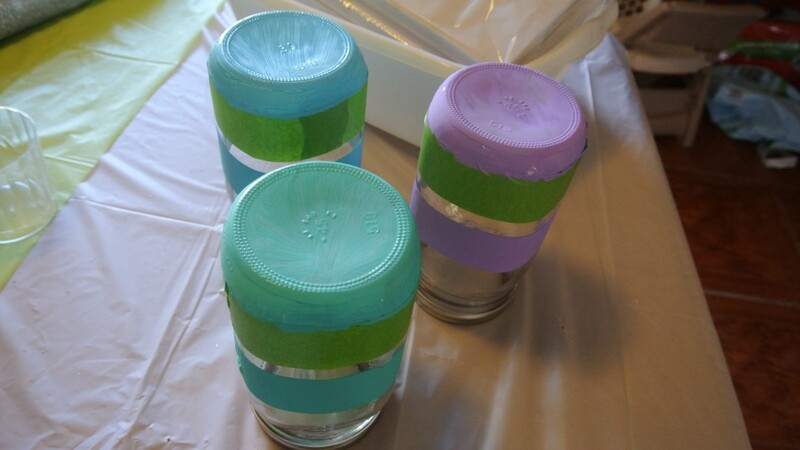 To adhere the letters to the paint stripe, spray the back of each letter with spray adhesive and stick them on where you want them on the front of each jar. Let them dry for a few minutes, and then brush over the letters + the rest of the paint stripe with modge poddge. 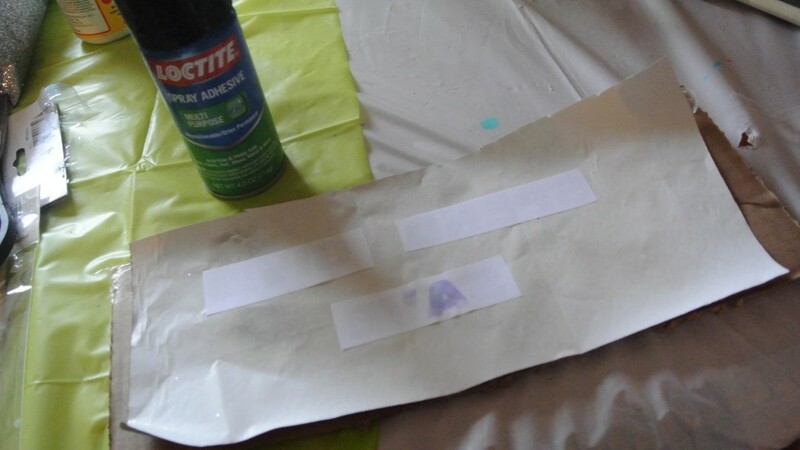 The spray adhesive WILL NOT hold the letters on well enough to withstand the tornado that is a toddler, so don’t skip this step! We talked about punching holes in the lids, but then decided to just screw on the outer lid, and leave the middle empty to make it easier for Jessica to put all those dollar bills in her money jars. And although she may not know right now what it means to Spend, Save, and Give, we can start teaching her how much money goes in each color (green, blue, and purple) to get her in the habit of splitting up her money, and then once she gets a bit older we’ll work on the different financial concepts in simple ways she can understand. Overall, I’m really happy with how they turned out + how inexpensive they were! 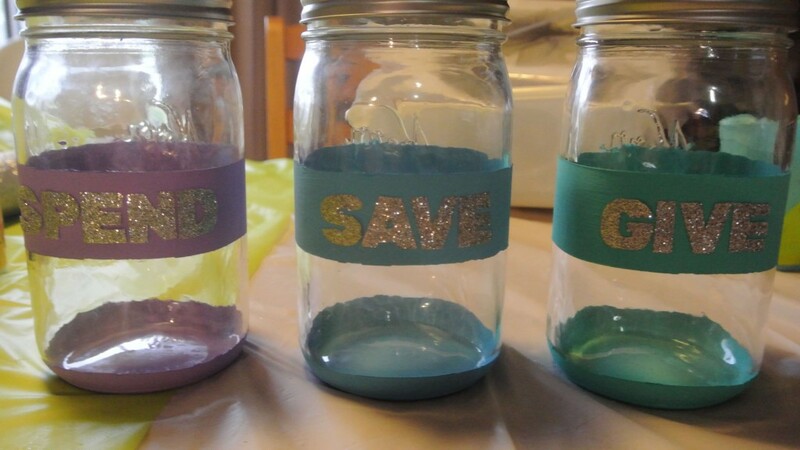 What types of money jars do you kids have? Are a fan of Smart Money Smart Kids?